Andy Cutting | The Goose Is Out! Andy Cutting is a rarity. 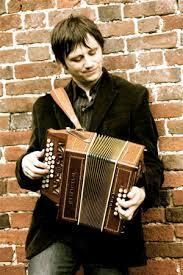 A musician’s musician: a soulful and technically outstanding melodeon practitioner with an ear for a fine tune. Andy has been a consistent musical force since he came swiftly to prominence with the innovative Blowzabella. As well as a thorough grounding in the English tradition, Andy’s influences extend way beyond these isles, particularly to the music of Central France and to the storming Quebecois tradition. These influences will be well-known to all those familiar with Andy’s duo with English fiddle player, guitarist and singer, Chris Wood. Wood & Cutting became one of the most influential, and enduring duos on the scene; paving the way for the explosion of many of today’s thrusting young newcomers. Click here to go to Andy Cutting’s website!